We take this opportunity to sincerely thank our Patrons for their generosity and continuous support. We also want to thank all our amazing volunteers who have helped us to make us what we are today as an alumni community. 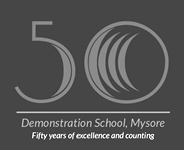 Our community needs all the help YOU can provide in terms of donations and volunteer work, so consider helping out the DMS Mysore Alumni Community so we can continue our work and place you on our Patron's page. The expenditure of the donations received so far can be found here.